This terrific vintage Zuni Indian silver and inlaid turquoise, coral, mother of pearl, and onyx mission church pin measures approximately 1-15/16" by 1-5/8". Has a secure closing roll over style pin back. I have left the original patina for you to polish as you choose. Like most older Native American jewelry, this piece is not stamped or hallmarked for silver content. It is sterling or a slightly lower grade of silver. Photos are not actual size. 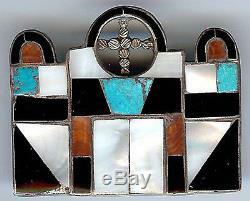 The item "VINTAGE ZUNI INDIAN SILVER INLAID TURQUOISE CORAL ONYX MISSION CHURCH PIN" is in sale since Tuesday, November 20, 2012. This item is in the category "Jewelry & Watches\Ethnic, Regional & Tribal\Native American\Pins, Brooches". The seller is "deja--voodoo" and is located in Santa Cruz, California.